I find myself automatically reaching for my UNIF goodies whenever I leave the house lately. And lord knows other fashion babies out there do the exact same thing. It's seriously getting a little scary. 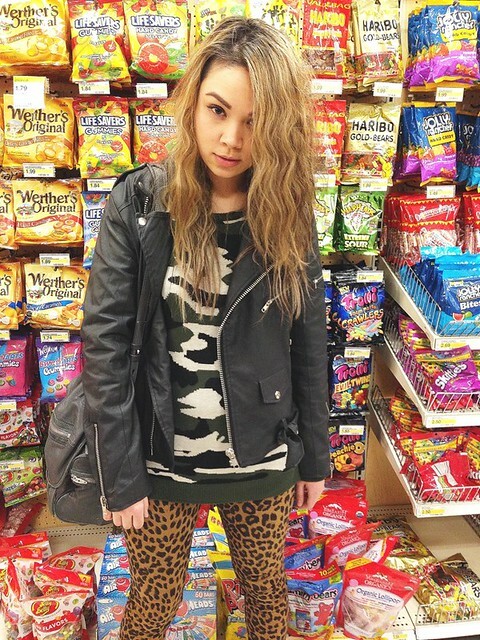 So glad my mission of looking like a dirt bag in the candy aisle at Target was accomplished. I definitely went a little wild during the Nasty Gal sale, and yup, reference the first sentence of this post and you'll find that the majority of my scores were UNIF. The UNIF Detention dress was #30-ish dollars. Insane! Insane in the membrane, people. I was ogling the Leo Zip Pants forever but couldn't justify the price tag until they dropped to under $30. The reviews all revealed the pants fit super small- like two sizes to small. Yup, they were right. Lord, are these suckers super tight. I might rip them up a little to change the skintight-suction-cup thing going on, but we'll see. They look super rad on, and I suppose that's all that counts for now. The iPhone finally happened, so there will hopefully be lots of instagramming happening!